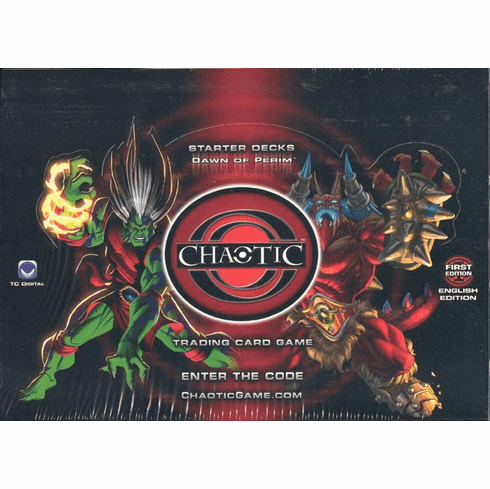 Chaotic CCG Dawn of Perim Case of Starter Decks includes 10 boxes. (5 Underworld and 5 Overworld) Each deck contains 1 Deck with 52 Cards, rulebook, and game mat. Battle in both the Real and Digital World with the brand-new card game, Chaotic. Challenges your friends in person and experiance the full extent of table top play. Or enter in each card's special code and play the game online. With the Variable Power Structure system, every creature card is totally unique, and any two creature cards will never be alike. Join Tom and his friends in the Chaotic world.